When a bike lane and road diet were approved by LADOT for 5.1 miles of N. Figueroa Street, from San Fernando Road to Colorado Boulevard, safe streets advocates were thrilled. The plan promised better pedestrian crossings, buffered bike lanes and reduced traffic speed. But once Councilmember Gil Cedillo replaced Ed Reyes in last year’s election, the plans were knocked off track. In less than a year, Cedillo re-opened the public process, stacked a meeting with representatives of city departments who weren’t representing their departments and is now phone-banking and sending out volunteers door-to-door against the project. The next meeting is Thursday of this week at 6:00 p.m. at Franklin High School. Despite Cedillo’s efforts, he has yet to fill a room with more people opposed to the project than for it. But after Fire Department Captain Ed Elguea of Station 44 appeared in uniform at the last public meeting to state that the road diet would negatively impact LAFD emergency response times, enough was enough. City Bicycle Advisory Committee Chair Jeff Jacoberger demanded to know on what basis Elguea made this claim in a public records request. The response is embedded above. The LAFD has undertaken no study that would back Elguea’s claim. But while Cedillo and road diet opponents flounder in opinions, road diet supporters continue to rally and organize under the #Fig4All banner. 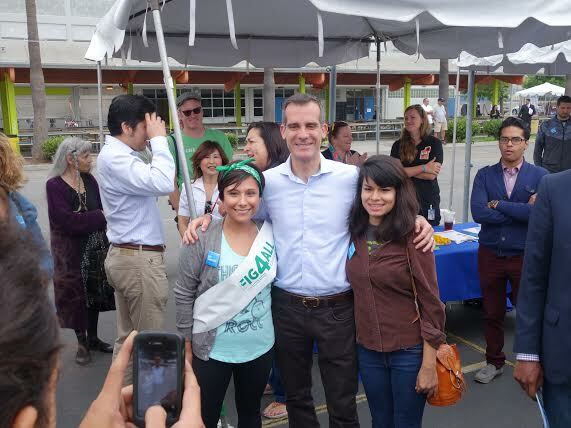 Nearly two-dozen “Fig4All” sash wearers walked with Garcetti and Cedillo during a community event this weekend. Last Thursday, the Highland Park Neighborhood Council voted to support the road diet and to write a letter to the city stating its position. Dude has always been pro-cars; he has never supported anything related active transportation. It shouldn’t surprise anyone that he is pro-car he’s had a long history of supporting projects that further perpetuate their use; such as the SR-710 which he supported when it was a freeway project and has supported the 710 tunnel alternative. Them days is long gone, and Cedillo is making a grave political miscalculation if he thinks he’s on the winning side of demographics, economics, and shifts in attitudes about what is normal when it comes to transportation. His legacy in NELA so far is that he’s organized more trash pick-ups while stopping a road diet in a community suffering a 29% adult obesity rate; he’s allowed a historic bridge to be demolished for no good reason, and the Southwest Museum still sits idle one year after his wonderful speeches about putting pressure on the Autry using his connections in Sacramento – oh, and the Museum’s native american mural has been desecrated with no response from the councilman’s office. We have another 11 years of this to put up with?! That 763 vote margin isn’t enough to keep someone in office with this kind of pattern of “leadership”. It is baffling to me that he’d write off a sizable cohort of active residents the way he has. Whether or not he supports bike lanes, we’re only going to get more organized, our numbers are only going to grow, and he’s going to look like more of a jerk if he stays on this path. What’s more surprising than that Cedillo just opposes the lanes is that he’s leading the effort against them. It’s unusual for an elected official to serve as the de facto head of an effort – much more typically they react in response to community (or funded groups’) opposition/support for things. This is bizarre in that there doesn’t appear to be a well-organized effort in opposition to the proposed lanes outside of the councilman’s own work on it. The days when nearly all California teenagers would count the days left before they could go to the DMV and get their learners’ permits are indeed long gone. The firefighters union did endorse Cedillo in the election in 2013. UFLAC drove their fire truck(s) around NELA with Cedillo banners waving. I am assuming they are expecting him to deliver on promises in exchange for their loyalty. I don’t think things are so craven as this, but you never know. I was shocked representatives from the police and fire departments would speak out against a project at a public meeting. If they think they need more facilities to serve the public, there are other channels they can use to get what they want. Glad their claims were found to be unsubstantiated though. In the last couple of days both Cedillo and Koretz have been exposed for the duplicitous liars they are when it comes to bike lanes and safer streets. Political leaders siding with the majority view of the public on whether to install safety improvements for bicycling smacks of what happened in the 1950’s and 1960’s in the south. Due to the wishes of the majority, the minorities had separate water fountains and schools, denied places to sleep at hotels and seating at restaurants, or had to get their food from the back of restaurants and were expected to sit at the back of buses. People who are blind, in a wheelchair, walking or riding a bicycle should be able to travel where they need to go on arterial or collector streets without the fear of being maimed or killed by a motor vehicle. Separating people from danger is a fundamental principle of industrial safety and bike lanes have been proven to reduce collisions between bicycles and motorists by 30%. Those that drive should not be able to deny better access on arterial streets by improvements to safety for those that ride bicycles. It was not put up to popular vote whether to improve the safety of automobiles by requiring the installation of air-bags, seat belts, safety glass and safety cells. Nor were there public meetings held to install sidewalks, walk signals and crosswalks on arterial streets throughout the city. Drivers did not get to vote on whether this should be done. Caltrans did not take a opinion poll of drivers before installing traffic signals at the top of freeway on-ramps that regulates the amount of motor vehicles accessing the freeways during peak hours. Nor did Caltrans take a public vote before installing HOT or HOV lanes on freeways. They installed them to keep the freeways from becoming congested enough to bring traffic to a standstill. During the early 1960’s a group of Davis California residents formed a group called Citizens’s Bicycle Study Group which repeatedly requested that the city install separated bikeways along arterial streets. The police chief and traffic engineers thought it was unworkable and the city council rejected the idea. They got new council members elected who were more bicycle friendly and the city within months after the election started experimenting with different types of bicycle infrastructure for major streets. Davis in the 2012 Census survey had a 19% bicycle commuting modal share and now has 52 miles of bike paths, 50 miles of bike lanes and 17 bridges or tunnels for bicycles in a city of 9.89 square miles. 2,366 miles of bike lanes. 2,460 miles of bike paths. Nice to see a scan of the CPRA response from LAFD. Can the request form/letter prompting the response also be included? Thx. This should be a broadsheet, translated into multiple languages, and passed out like a revolutionary pamphlet in CD1. The sad thing is a gal from Fig For All Called Cedillo’s office and asked if we could present this letter as it is an official direct response to his friends in the dept that spoke at the last meeting. They said no, they are going to stand on their friends ‘opinion’. So not only were we not able to ask any questions at the last meeting we are not allowed to submit any information that contradicts what Councilman Cedillo is supporting at the meeting tonight. I guess this is how Cedillo is going to address every issue in our community ignoring the majority of his constituents. Everyone and I mean everyone not just bike lane supporters should be worried for our community. Please look at the attached video this is what he is about. Campaigning with support for lanes the immediately doing an about face when elected.